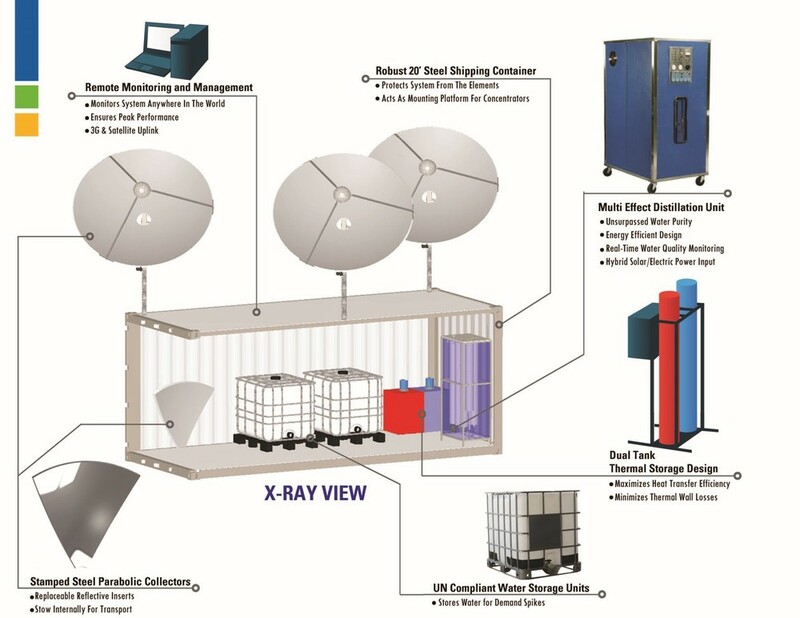 Every aspect of Epiphany’s technology, from our solar concentrators, to our thermal management systems, to the distillation units, has been specifically designed to be modular in nature. This makes the technology easily scalable so that it can serve the water needs of individual households, buildings, small villages, and entire communities alike. Individual households and small villages can benefit from a single Epiphany E3H unit by purifying virtually any source of water, including seawater or brackish groundwater. A 100% solar powered Epiphany E3H can provide up to 500 gallons (1900 L) of pure drinking water per day. At the World Health Organization (WHO) standard of 2 gallons per person, per day, this is enough water to supply the basic needs for up to 250 people. Epiphany's E3H units have been designed to be robust, inexpensive, and reliable for use in remote locations where replacement parts are difficult to source. Epiphany’s larger-scale offering is the Micro Municipal Distillation Plant. This style of system can be configured to produce as little as 10,000 gallons (38,000 L) of fresh water per day, and up to more than 1M gallons (3.8M L) per day. The design is referred to as “micro” due to its small scale in comparison to conventional municipal desalination plants, which are typically designed to process several million gallons per day. The Micro Municipal Plant uses many of the same components as the E3H system, with the primary difference being the number of dishes required to power a higher capacity distillation unit. Because of the larger physical size of the plant, it must be field assembled, which will take a few days to a few weeks depending on size of the system. Epiphany’s Micro Municipal Plant design allows a fundamental shift in the municipal water desalination industry. By decoupling the desalination process from grid power, Epiphany is able to offer rapidly deployable, prepackaged systems capable of purifying water at the point of use. This is a tremendous advantage over the traditional, large scale, custom engineered-systems, which require several years of planning for each plant as well as major investments in water delivery infrastructure. The end result of this technology will be the construction of a vast, decentralized network of small-scale water purification plants, each supporting a local community. This will allow optimization of water grid infrastructure and water purification resources. Most importantly, it will make economically and environmentally sustainable seawater desalination a reality for the majority of the developing world for the first time in history.